Seller Agent Comments: As you enter this single-level home in a cul de sac, you will be greeted by a large living room that is completely surrounded by large windows that invite lots of natural light, and a view of this beautifully manicured front yard. The kitchen is sunny with a sweet breakfast nook, an inviting spot to gaze into the lush backyard, in search of frequent deer visitors.Three comfortably sized bedrooms, one with a private full bathroom,and a very large bonus room that could easily adapt to your every need. French doors from this large room lead to the expansive back yard.The property‚Äôs front and back outdoor space is impressive, complete with many native trees and plants.There’s even filtered views from the front yard! Seller Agent Comments: More than you imagined Albany could offer. Situated in a truly sweet spot almost equal distance between Monterey Market and Hopkins shops and Solano Avenue restaurants, this home features three bedrooms including a master that makes you feel that you are sleeping in a tree house, plus two rooms suitable for offices or playrooms, a sun filled living room with vaulted ceilings and a stone fireplace and a second floor Bay View family room with Cathedral ceilings, French doors to cedar decks, an updated kitchen, fresh paint inside and out and many other features await you and invite you to your new home. Sellers’ Representative: CYNTHIA H SPEERS THE GRUBB CO. INC. Seller Agent Comments: Location, Location, Location.. Steps from Solano Ave. Great Albany MacGregor, Cute as a button! Large bright living room with fireplace, skylights in both bedrooms. Original tile in bathroom & Kitchen. Dining area, Hardwood floors. Central Heat. Laundry room leads to rear yard, with your touch, can be lovely! 1 car attached garage. Easy access crawl space! Walk to Albany Schools! Close to Albany Pool, Memorial Park, Solano Avenue Dining, shopping, movies, Transportation, El Cerrito Plaza & BART! Sunday Open House 6/17 & 6/24 2-4:30pm. Seller Agent Comments: Nicely maintained six unit apartment property located in highly desirable City of Albany. All units are two bedroom, one bath. Rents are well below market providing substantial upside for investors. All existing rental agreements are month to month. Two units will be delivered vacant at COE. Tenants pay PG&E. Owner pays water and garbage. Off street parking includes four carports and two uncovered spaces, storage lockers, on-site laundry (owned). Building is ideally situated only blocks from Solano Av shops/cafes and BART. Exceptional investment opportunity! Please email for marketing package and disclosures. Seller Agent Comments: Set above the city of Berkeley with mesmerizing city lights and beautiful Bay views, spacious yard, roomy solar powered home and acclaimed Berkeley schools. The seller‚Äôs ENTIRE electric bill was less than $200 per year! Newly landscaped front yard with level in entry to the main level features a spacious family room, dining area with views & a bedroom/office with half bath. Updated cook‚Äôs kitchen. Warm hardwood floors & modern lighting throughout. The master suite has a separate sitting area/office with a large window looking out to the bay bridge, San Francisco and Oakland city lights and the bay. The master bath features custom tile, cabinetry and hardware. There are two additional bedrooms & a full bath on this level. The downstairs level features a large family room with sliding door to the backyard, a third full bath, a large storage room, a large laundry room with washer, dryer and utility sink. The backyard has raised planting beds & a charming gardening shed/ playhouse. Seller Agent Comments: This is a lovely gracious home, level in from the 2 car garage. The floor plan works for terrific separation of spaces; 3 bedrooms up stairs which includes a master bedroom and bath. Lots of closet space for each bedroom plus hall closet and linen closet. Every room has plenty of light. The living room is full of light from large windows that bring in views of the bay. Access from the living room to your back yard for your garden party. The lot is over 6,700 aprx. square feet. The kitchen and dining room is easily accessible and provides space for the family room meet-ups, each facing west for more sunlight. The local bus system is at the corner and Tilden Park nearby where you can visit the Little Farm, ride the steam train and visit the nearby Golf Course. Seller Agent Comments: Lovely Mediterranean Style home in the Berkeley Hills. The living & dining rooms have views, period details & lots of light. Bright, updated kitchen. The flexible layout has two bedrooms with their own garden access and separation of space. Downstairs suite a possible in-law. Whimsical garden with lotus pond and winding path to gazebo retreat. For play, entertainment, or serene contemplation, the deck & garden are special destinations. Quiet neighborhood near Gourmet Ghetto, UC Berkeley & parks. Seller Agent Comments: Opportunity awaits Builders, Contractors, Investors or someone with a great vision. Live in this location and neighborhood of Thousand Oaks. Minutes to Gourmet Ghetto and Indian Rock Park. Close to UC Berkeley Campus and BART. Restaurants and coffee within minutes. This home is a complete fixer upper or better yet tear it down and rebuilt something fabulous. Lot size is 4700 sq ft. Home is 1104 sq ft. Seller Agent Comments: Affectionately referred to as the ‚ÄúFairytale House‚Äù by many of the residents in the neighborhood, this incredibly charming property, with its storybook curb appeal, offers elegant light-filled interiors & an enchanting rear garden. Situated in the highly sought-after Thousand Oaks neighborhood in North Berkeley, this classic Tudor-style home boasts the quintessential Tudor exterior with its high-pitched gable roof, decorative stone accents & dark trim woodwork. Inside you‚Äôll find original details including multiple built-ins, vintage light fixtures, and leaded glass windows. Enchanting multi-level backyard filled with a dazzling array of plants, floral accents, mature trees, and meandering pathways to giant boulders gorgeously covered in weathered moss. Conveniently located just blocks from popular Solano Ave shopping/dining amenities. This desirable neighborhood boasts great schools and easy access to transportation, BART, & multiple bus lines just minutes away! Open Sat/Sun 2-5pm. Seller Agent Comments: Stunning N. Berkeley Mediterranean home re-imagined & brought to life by Berkeley’s own Bay Reach Homes, going to great lengths to preserve the home’s storied history while integrating quality construction, creative design & luxury finishes. The 4BR, 3.5BA home features a chef’s kitchen perfect for home-cooked meals & entertaining with: Thermador appliances, large island, custom cabinetry & French doors which open onto your private deck. Bright & expansive main level has a formal dining room, living room with cove ceiling, possible home office/guest bedroom & separate family room with easy outdoor access. Private quarters feature 3BRs and 2BRs on one level; owners’ suite has its own gas fireplace, walk-in closet & luxury bathroom w/dual vanities, heated floors & custom shower. California indoor-outdoor lifestyle is personified with built-in seating, fire pit, water feature, and views of SF, the Bay & Golden Gate. Enjoy the serenity of the hills while being only moments from the action! Seller Agent Comments: Handsome and spacious top floor condo in South Berkeley. Excellent Elmwood Location near all the best Berkeley has to offer: Only blocks to UC campus, Elmwood shops, Coffee, Movies, Waking Distance to University Dining Hall, Gym, Shattuck Ave and BART, Buses and Berkeley Bowl. Spacious living room, dining area, updated kitchen and bathroom, and balcony. One-car deeded garage parking. 3 stairwell entrances and 2 elevators with landscaped interior courtyard. Mark Twain HOA monthly due includes common heat, water, hot water, trash, exterior and ground maintenance, elevators, security gates, earthquake insurance, management, and reserve. This home is located in the well run and maintained Mark Twain complex. It has a beautiful landscaped interior courtyard with sitting/studying area. Must see to appreciate it. Seller Agent Comments: OH Sat & Sun 6/16 & 6/17. This Gorgeous Duplex in Berkeley‚Äôs thriving Poets Corner is truly an exciting opportunity. With its three distinctly different spaces, surrounded by lush, diverse gardens traversed by a flagstone patio & paths, this magically unique property is sure to inspire its new owners to live, & enjoy! The first floor two-bed, one bath Craftsman flat W/open living and dining rooms & original wood floors, columns, fireplace, & built-ins that lend an air of stately calm & refinement. The upper level home is strikingly different from downstairs: an original, Victorian charmer W/two bedrooms & lots of extra space for guests or creative pursuits. Victorian architectural details include 10‚Äô ceilings, more built-ins and a fireplace. A very large, nicely finished skylit attic (which has been used as a third bedroom in the past). Yet another bonus space awaits in the back yard ‚Äì an authentic ‚Äúwater tower‚Äù that‚Äôs been converted to an ‚Äúurban-bohemian‚Äù studio. Seller Agent Comments: OH Sat & Sun 6/16 & 6/17. This Gorgeous Duplex in Berkeley‚Äôs thriving Poets Corner is truly an exciting opportunity. With its three distinctly different spaces, surrounded by lush, diverse gardens traversed by a flagstone patio & paths, this magically unique property is sure to inspire its new owners to live, & enjoy! The first floor two-bed, one bath Craftsman flat W/open living and dining rooms & original wood floors, columns, fireplace, & built-ins that lend an air of stately calm & refinement. The upper level home is strikingly different from downstairs: an original, Victorian charmer W/two bedrooms & lots of extra space for guests/creative pursuits. Victorian details include 10‚Äô ceilings, more built-ins and a fireplace. A very large, nicely finished skylit attic (which has been used as a third bedroom in the past). Yet another bonus space awaits in the back yard ‚Äì an authentic ‚Äúwater tower‚Äù that‚Äôs been converted to an ‚Äúurban-bohemian‚Äù studio. Own your own water tower in Berkeley! Seller Agent Comments: A sweet garden greets you as you walk through the double doors of this charming 2 bedroom 1 bath split-level home. The entryway has been artfully closed in, creating a perfect spot for unloading¬†your bags and taking off your coat. Enter the living room, with a huge front window and light streaming in. The dining room is separated only by partial dividing walls, creating the ever-coveted open-concept feel. The kitchen is a modern-throw back to the 1950’s with checkered floors, a cool antique stove and unique tin backsplash. Tons of storage and plenty of counter space and an ample breakfast-nook make conversations and cooking possible.¬† Both bedrooms offer large closets with organizers and double doors for easy access and are equally close to the charming bathroom with lovely pedestal sink. In terms of walkability, this is it! Close to tons of restaurants, cafes, nursery, and cool clothing and antique stores. Sellers’ Representative: ANNA V BELLOMO THORNWALL PROPERTIES INC. Seller Agent Comments: Stack wash/dry off bathroom. Mstr suite features balcony over the landscaped backyard with waterfall pond and glass garden shed. Solar power cuts your electric bill way down! A unique family room connecting the bedrooms. Bonus basement has full bath not listed in the tax roll. Seller Agent Comments: Rare six-bedroom, three bathroom home with an additional 2 bedroom, one bathroom unit for rental or extended family. Filled with charming custom details like built-in cabinets, box beam ceilings, and hardwood floors this home epitomizes Berkeley charm. An easy walk to the shops and restaurants in Berkeley‚Äôs West Bank and convenient to Ashby BART and other transportation options. Three generously sized bedrooms and two bathrooms are on the main level with three bedrooms on the upper level. Sizable second floor bathroom feature a shower and double spa tub. Cooks will delight in the stylish and spacious upgraded kitchen with quartz countertops and stainless steel appliances that also features a cozy breakfast area. Large living room and dining room area is perfect for large family dinners and entertaining. A large yard is ideal for children or planting your own vegetable garden. The stand alone, two bedroom, one bathroom unit is ideal for rental income or extended family. Seller Agent Comments: A sleepy street right in the middle of it all! Gorgeous mix of traditional craftsman detailing & modern touches, this 2-bedroom, 1-bath home is an ideal place to come home to. Gracious entryway leads to ample living room w/ custom windows overlooking front yard & allowing plenty of light. Dining room, w/ more gorgeous built-ins & continuation of wainscoting details, picture molding, & architectural features is large enough for a big gathering. Kitchen is a combination of traditional & updated cabinetry w/ stool-height bar for snacking & room for office space. Bedrooms have good light & nice closets. Backyard is full of veggies & has access to ADU-potential garage w/ washer/dryer. Large standing basement for extra storage & long driveway for tandem parking. 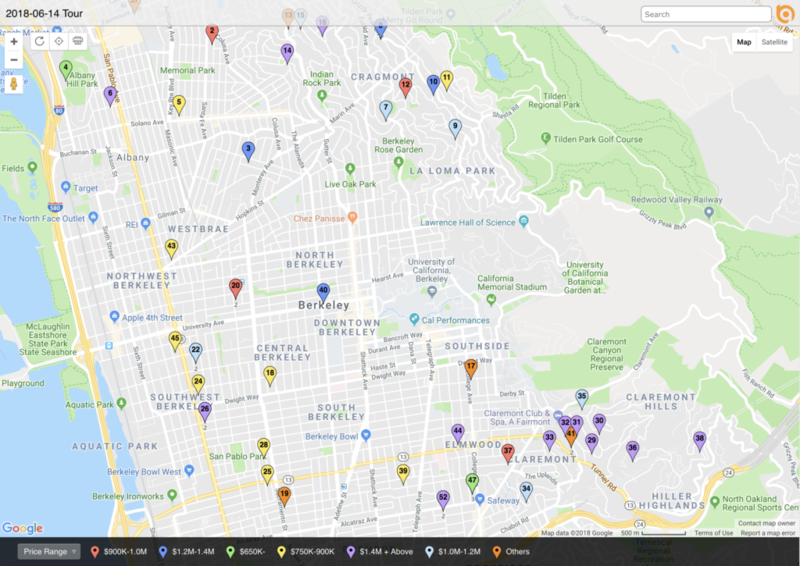 Close to many features of South Berkeley – 3 blks to San Pablo Park, under 1 mile to Ashby BART and Berkeley Bowl West, around corner from Spiral Garden. Sellers’ Representative: SARAH H RIDGE THORNWALL PROPERTIES INC. Seller Agent Comments: Beautifully updated, architecturally significant, traditional with Dutch Colonial characteristics in one of Berkeley’s best neighborhoods. This is a well designed floor plan with great proportions and wonderful detailing. The main floor is perfect for entertaining or enjoying alone. Large, yet comfortable, rooms, high ceilings and lots of windows provide an open outlook onto mature, established, low maintenance landscaping and a personal sized redwood grove. The second floor contains one large bedroom with ensuite bath, two additional bedrooms and the master bedroom suite with sitting room and spa style bathroom. The third floor, not counted in the assessed square footage, is a huge art studio, great room, or home office. The lower level, also not on tax records, is a huge partially finished basement area with wine cellar, laundry area, and plentiful room to store all the toys. A two car tandem garage rounds out the lower level. Seller Agent Comments: Every nook and cranny of the property speaks to its creative, imaginative and romantic style. Vistas from large windows everywhere invite you to partake in the gorgeous Bay and City views. The property invites you into every room with rich, vital touches throughout this amazing home. Tons of decks and balconies to take advantage of the view. Really choice property! Seller Agent Comments: Nestled in the serene Claremont hillside, 73 Alvarado is a lovingly cared for classic brick tudor. Designed by San Francisco architects Morgan & Hoover in 1951, this 4 bedroom, 3.5 bath home sits on a sloping lot and boasts over 2,700 square feet. Formal living and dining rooms have direct access to a deck with bay views that overlook lush green foliage. Upstairs, there are 3 bedrooms, 2 bathroom, one of which is a large master suite with sitting area and a newly remodeled bathroom. The main level has a grand living room with fireplace and formal dining room. The kitchen features stainless appliances and white painted cabinets with a view toward the Claremont Club & Spa. There is also a main level bedroom and one and a half baths. This home features a bonus flex space on the lower level with kitchen & bathroom. Fabulous location adjacent to The Claremont Club & Spa and close to the shops and restaurants that line Claremont and College Avenues and downtown Berkeley. Seller Agent Comments: Welcome to this classically beautiful home, updated with smart, modern style.¬† Spacious, light-filled rooms convey an opulent feeling from a more genteel era.¬† At the same time, solar technology and energy efficient systems make for easy living and a small carbon footprint.¬† Contemporary lighting helps blend old and new in a most pleasing way. SF Bay views and great backyard entertainment/play areas. One of the Bay Area’s destination neighborhoods. Seller Agent Comments: Bay Views from this arch. designed mid-century by Harry A. Bruno. Open floor-plan, nearly level-in, stylish and well sited one-level living. Spacious + sun-filled living/dining with walls of glass. Beautifully maintained + tastefully remodeled with a gourmet kitchen, fresh paint. HW floors and sleek custom built-ins. An additional study alcove extends from the large living room. A two-car garage has interior access and provides plenty of additional storage. Spacious view deck. Rooms are generously proportioned + airy evoking a sleek and modern feeling while maintaining maximum privacy. Perfectly suited for down-sizing or as a sophisticated starter home located adjacent to Rockridge and Elmwood shops, close to Rockridge BART, UC Berkeley, parks, trails and an easy commute to San Francisco. Seller Agent Comments: Great Claremont Heights location with north bay and Claremont Canyon Reserve views. Contemporary modern design. Chef‚Äôs kitchen with stainless steel appliances, custom slab counter tops, custom cabinets, designer plumbing & lighting fixtures. Lavish master bedroom suite with custom cabinets, slab tops. Level backyard space and over-sized deck perfect for entertaining and family gatherings. Don‚Äôt let the published walking score mislead you. A little known city-walking path gives one access to shopping and restaurants. New construction, high end finish work, & serene views can all be yours. Seller Agent Comments: Beautifully sited on a large premier parcel with stunning panoramic Bay & City views from all three floors, a home like this rarely comes on the market. Designed by Jarvis Architects, this truly grand+ luxurious 5BR/4BA Spanish Revival home has an impressive entryway that welcomes you to the dramatic double-height foyer with modern Mediterranean stone finishes. On the main level, generously sized formal living, dining + family rooms, as well as a spacious + well-appointed light-filled kitchen overlook the breathtaking views. The breakfast area opens to sunny deck + adjoining mudroom leads directly the garage. On the second floor, the Master Suite features a room-length custom walk-in closet and a lavish split bath. 3 addl BRs and 3 baths, a spacious laundry room are ideally located. Downstairs, another generous guest bedroom + large family room, office or media room, and access to the expansive view deck ‚Äì with the Bay Area at your feet. Seller Agent Comments: This delightful French cottage was reportedly built for an Opera singer in the 1920’s. Throughout the house you will find stained glass windows and built-ins, high ceilings, and beautiful hardwood floors. The property has 2 sunny bedrooms and 2 baths, plus a bonus space perfect for a study or workshop. The sweet period style breakfast room has period wall paper and a bank of windows which offers a lovely outlook. The very private petite Mediterranean garden is resplendent with fruit trees and flowers. The attached undersized garage has interior access to the main house. This A + location, between College and Claremont Avenues, offers easy access to the myriad of Elmwood’s eclectic shops and restaurants, as well as proximity to UC Berkeley, the Claremont Hotel, and BART. Sellers’ Representative: CANDICE ECONOMIDES THE GRUBB CO. INC. Seller Agent Comments: This stunning Contemporary in coveted Claremont Hills features an elevator on four floors and two Master suites. Four balconies provide indoors to outdoors flow for casual living & entertaining. The private, terraced back yard features multiple landings for dining or relaxing and is perfumed with citrus, flowers and herb gardens. The chef’s kitchen includes Bosch appliances, garden window, a pantry and granite counters. Every window shows expansive views, with some of the bay. Also includes: Whole House Electronic Air Cleaner System, Intercom, Fire Sprinklers, Built-In Stereo Speakers. Seller Agent Comments: Charming Berkeley bungalow with 2 bedrooms, 1 bath, hardwood floors throughout. Good natural light. Walk score of 91. (Blocks to BART, Whole Foods). Freshly painted interior. Great opportunity. Seller Agent Comments: Sophisticated 2 bedroom/2 bath corner unit with beautiful updates in desirable Rockridge. The light-filled living room features gas fireplace, wet bar, built-in bookshelves and wall of windows. Running the length of the home is a private balcony with a peek of the Bay and ample room for dining and relaxing. The tastefully upgraded kitchen with quartz counter tops and stainless steel appliances adjoins the formal dining room. Spacious master suite with double closets, in-unit laundry, hardwood floors, on-site garage parking and storage. A wonderful retreat with privacy and comfort near College Avenue shops and restaurants, BART, bus lines and other amenities. Seller Agent Comments: Built in 1923 and converted into a condo in 2010, charming, 1 bed/1bath unit on the second floor, is on the famous Benvenue ave in Rockridge, light filled, private first-floor condo offers built-ins, fireplace & ample closet. one of Oakland’s most desirable, charming & convenient neighborhoods. One of 3 units for sale. Open Sunday 6/17, 2-4:30 p.m. Seller Agent Comments: Built in 1923 /converted into condos in 2010. Charming,one bedroom and one bath unit on the first floor on famous Benvenue ave in Rockridge. Light filled, private first-floor unit offers 1923 built-ins, fireplace, hardwood floors, updated kitchen, kitchen nook, newer appliances, granite counter tops, high ceilings and ample closets. Rockridge, one of Oakland’s most desirable, charming and convenient neighborhoods. access to San Francisco (Rockridge BART) easy access to the UCB. The unit also features double pane windows, parking space (carport only for this unit). It is one of the 3 units that will on the market. Sunday open 06/17 from 2-4:30p.m.. Seller Agent Comments: Built in 1923 and converted to condos in 2010, New carpet, updated bathroom, good size kitchen,kitchen nook w skylight, builtins, ample closets, fireplace, light-filled unit. one of Oakland’s most desirable areas, Rockridge, charming & convenient neighborhoods. Close to Rockridge BART station, UCB and shops and restaurants, One of 3 units for sale. Open Sunday 6/17 -from 2-4:30. Seller Agent Comments: Leave the world behind you as the elevator door, accessible only by you, opens to the one-and-only Penthouse at 5405 Carlton with floor to ceiling glass presenting Bay & beyond panoramas. It spans San Francisco Bay, the iconic bridges, reaches Mt. Tam, sweeps to Berkeley‚Äôs Campanile with hills above, & overlooks the neighboring Claremont Country Club‚Äôs green-and-pristine fairway. The Penthouse with two bedrooms &two baths was recently updated including hardwood floors through-out and feels like a single family home sitting on a rooftop with just installed $73,000 of new wrap-around decks & no neighbors. The view-savoring master suite features a wall of configured closets, built-in bureau, plus walk-in dressing-room closet. Upgraded infrastructure includes parking and dual-pane windows that minimize sound and help maintain desired temperature, whether generating warmth via the gas fireplace or cooling via the unit‚Äôs central air conditioning. A security building with internal parking. Sellers’ Representative: ANTHONY RIGGINS SOTHEBY’S INTERNATIONAL REALTY, INC. Seller Agent Comments: Recently updated Clarewood townhome with new fixtures and finishes. Eat-in kitchen now features quartz stone counter tops, olive glass tile and stone backsplash, new stainless steel appliances and oak hardwood floors. Freshly painted and newly installed carpeting. Designed for entertaining with both a formal dining room and three decks with two on the mail level and one off of the master suite upstairs. All three bedrooms and two bathrooms are upstairs. All three bathrooms have been updated with custom tile work in the two upstairs. Located on Clarewood Lane, this townhome is one of the larger units at Clarewood. Community pool recently refinished with new plaster, coping and LED lighting. Clubhouse with kitchen next to pool can be reserved for private parties by homeowners. Sauna has newer heater. Seller Agent Comments: Rare and spectacular opportunity to own an incredibly special property in Rockridge! This is the original homestead that started Rockridge so many years ago. Used by a San Francisco family as a vacation home, this property now offers gracious living, with rental income, in a spectacular and prized location in one of the hottest cities in the U.S.: Oakland, CA! Coveted Rockridge is the place to be! Offering a spectacular, renovated owners home, plus income from the two, two bedroom, one bath apartment homes, plus a studio! A secret garden with fig and apple trees, and a statuesque Monterey Pine, all hidden in your urban paradise, with access to the dining and shopping on College Avenues, and Rockridge BART, highway 24 to 580 and 80 and beyond! Open Sunday 6/10, 2 to 4:30. Seller Agent Comments: Rare and spectacular opportunity to own an incredibly special property in Rockridge! This is the original homestead that started Rockridge so many years ago. Used by a San Francisco family as a vacation home, this property now offers gracious living, with rental income, in a spectacular and prized location in one of the hottest cities in the us: Oakland, CA! Coveted Rockridge is the place to be! Offering a spectacular, renovated owners home, plus income from the two, two bedroom, one bath apartment homes, plus a studio! A secret garden with fig and apple trees, and a statuesque Monterey Pine, all hidden in your urban paradise, with access to the dining and shopping on College Avenues, and Rockridge BART, highway 24 to 580 and 80 and beyond! Open Sunday 6/10, 2 to 4:30. Seller Agent Comments: Surrounded by Roses at the Top of Haddon Hill ‚Äì W.E. Schirmer‚Äôs Late Mediterranean Revival Stately Mini-Mansion with wonderfully preserved period details: circular stair beamed foyer, tinted plasterwork, grand living room with music alcove, library/study suite, prohibition-style ‚Äúspeakeasy‚Äù in the family/game room with adjacent Vargas ‚Äúpin-up‚Äù girl bathroom, turret, grand front porch, French doors, arched windows, verandah, balconies, loggia (now covered), tile roof! There are lovely bay views, storage, interior access from the garage, play house and an incredible workshop. This corner, level, ¬º acre landscape has an amazing walled back garden and yard, mature landscaping and one of the finest private rose gardens in the East Bay. This is a once-in-a-life-time opportunity in one of Oakland‚Äôs best kept secret neighborhoods with close proximity (walk score of 85) to transportation (freeways, buses, casual carpool), noted restaurants, coffee, movies, shopping & a famous farmer‚Äôs market. Seller Agent Comments: ONE OF A KIND Spanish Style Home. 3 bedroom, 2 bath. Views. Extensive custom details throughout. Crown molding, wainscoting, Hardwood Oak floors, custom tile. Great Open Floor Plan. Amazing ‚ÄúChefs Kitchen‚Äù Professional Grade Appliances – Living Room with Gas Remote Controlled Fireplace and Access to Massive Entertainers Deck – Master Bedroom Suites With Fireplace – Upgraded Electrical – Plumbing- Central Heat – Dual Pane Custom Windows – Serene Back Yard – 2 Car Garage – Additional off Street Parking. 5 minutes from BART, Regional Parks, shopping. Seller Agent Comments: Adorable cosmetic fixer in the Fairmount Gardens neighborhood near El Cerrito Plaza and BART. Structure is solid and foundation is good, but this house is ready for a new kitchen, bath, floors, and windows. Pest report is less than $3,500. Located in a wonderful, caring community with diverse homeowners, kids, pets, and block parties. Just a few minute’s walk to Harding School and dine-in Cerrito Theater. Large, level, sunny rear yard. Fairmount Gardens is a horseshoe comprised of 3, one-block long streets, with cul-de-sacs at the corners. This home is surrounded by lovely, well-kept properties. Don’t miss this opportunity to buy an affordable home and build your own sweat equity. Seller Agent Comments: Fabulous and spacious El Cerrito home! 3+++BR Includes family room and 2 rooms downstairs that can be guest suite or study or au-pair suite! Panoramic Views! Late mid-century gem! Indoor/Outdoor living with doors that open to level out patio. Spacious double garage. Many extras! Seller Agent Comments: Super charming home with spectacular Bay views, wonderful outdoor spaces too, including patio level lawn and gardens. Light-filled living room with raised hearth fireplace, dining room, kitchen and laundry room. A wonderful property to call home with close proximity to commutes, public transportation, etc. Seller Agent Comments: NEW PRICE. MOVE IN CONDITION. Panoramic views of the Bay and City lights from this charming 4 bedroom, 2.5 bathroom, 2 car garage 2256 sq. ft. in a single level home. One block away from the Arlington in El Cerrito near the Berkeley Country Club, public transportation and Madera School. Spacious home offer many upgrades, open floor plan, crown molding and luxury gourmet kitchen with stainless steel appliances, large dining room, and living room. Deck off the dining room to relax and entertain. Washer, dryer included. Don‚Äôt miss this beautiful updated home. Brokers tour; Thursday 6/14/2018 10 A.M – 1 P.M. Open house; 6/14/2018 6 P.M. – 8 P.M. Saturday Open House 6/16/2018 2 P. M – 5 P.M. Seller Agent Comments: Expansive Mid-Century modern design c. 1960 features a dramatic gallery entry hall. Incredible versatility and space. Updated. Property being sold with a separate parcel APN: 505-291-014-7, 8551 Terrace Dr. – and includes a fantastic large workshop at the back of property. Prime location, close to Trans-bay Bus stop, min to BART and in acclaimed Madera school zone. Bay views too. Seller Agent Comments: Incredible opportunity for a huge amount of space in a commute-friendly neighborhood. The bus to BART stops right in front of this home, and both Tassajara Park and the greens of Berkeley Country Club are within two blocks, with Wildcat Canyon directly beyond. Stop by the nearby Arlington Market for coffee and fresh baked goods in the morning, or grab a bottle of wine on the way home. Soaring ceilings define this multi-level home. Enter into the large den with fireplace, and then through to the bright living room, formal dining room, and spacious kitchen. You will find ample space for a home office among the five expansive bedrooms, two with en-suite baths, and an abundance of natural light enhances the lofty feel. Tons of storage in oversized closets in addition to the two-car garage. Seller Agent Comments: Come home to breathtaking views of the bay, bridges, and city at this exceptional Vue46 corner penthouse. Highlights include a 1,656 sq ft open floor plan, soaring 18 ft ceilings awash with natural light via 36 panes of glass, and mahogany-stained wood floors spanning the main living area. An enclosed bedroom, full bathroom, and a modern kitchen with gas range and stainless appliances complete the main floor. Upstairs, a spacious loft area perfectly frames gorgeous views that seem to go on forever. The master suite offers California-style walk-in and full-wall closets, and a stylish modern bathroom with double vanity. Dual zone air conditioners and a private sundeck with dazzling views off of the master suite are features exclusive to the unit. Other notables include in-unit laundry, 2 deeded garage spaces, and a secure storage area. The complex offers a fitness center and shared community space, and is conveniently located near restaurants, shops, BART, and the Emery Go-Round shuttle.